We’d love your help. Let us know what’s wrong with this preview of Second Helpings Please! by Norene Gilletz. 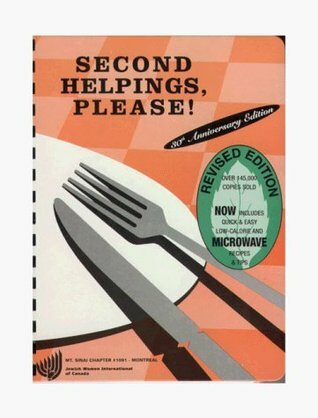 To ask other readers questions about Second Helpings Please!, please sign up. 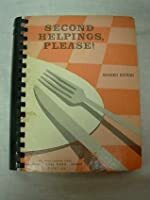 Be the first to ask a question about Second Helpings Please! Who reads a cook book? I went through this cover to cover. It is an invaluable resource, a milestone is the annals of Jewish cooking, a must for the single man. I would have been lost forever without it. I was lost (though didn't know it then) when I replaced it with a cook+. Better the book to eat by... more satifying, more nutritious, more honest cooking. LOVE it. I love this series!!! It is awesome!!! And no crapola in it like I originally suspected!!! AWESOME!!! My "go to" cookbook. I love it! Made the chocolate chip cookies - a go to for us. Base for peanut butter and raisin and oatmeal (sub 1/2 cup flour with oatmeal flour). I use only 1/2 cup of butter. just tried the macaroons - so easy and so awesome. The fluff right up in the oven. This minimalist recipe book is easy to use with quick tasty foods. A Jewish friend gave this to me in Toronto. 45 recipes I'd like to check out... I'm hungry! Norene Gilletz is one of Canada’s leading kosher cookbook authors. She is a culinary consultant, cooking teacher/lecturer, culinary spokesperson, cookbook author, and freelance food writer, focusing on healthy cooking. A certified Culinary Profession with the IACP (International Association of Culinary Professionals), her culinary career began at the age of three helping prepare meals in her mothe Norene Gilletz is one of Canada’s leading kosher cookbook authors. She is a culinary consultant, cooking teacher/lecturer, culinary spokesperson, cookbook author, and freelance food writer, focusing on healthy cooking. A certified Culinary Profession with the IACP (International Association of Culinary Professionals), her culinary career began at the age of three helping prepare meals in her mother’s kitchen and where at age nine she invented her first recipe; she has never looked back. The Food Processor Bible, and The Low Iodine Diet Cookbook. Norene lives in Toronto, Canada. To learn more about Norene Gilletz, visit her web site, http://www.Gourmania.com. “I have found that making just a few small changes in your diet can add up to significant health benefits,” Norene says.